This delicious leafy plant enhances any salad with its peppery, spicy and tangy taste. Arugula's light to dark green, fleshy leaves resemble elongated oak leaves. Older arugula leaves will also have a much stronger flavor than newer ones; its flowers are edible when used as a garnish. When the plant matures it produces four-lobed white flowers with purple veins that are also peppery in flavor and equally edible. 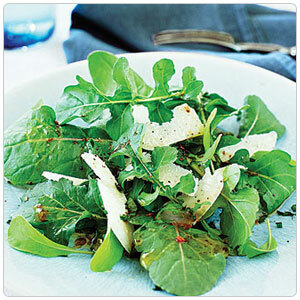 Arugula is considered an herb, a salad green and even a leaf vegetable, making it a versatile ingredient in the kitchen. When arugula is grown as an herb it is often woodier and more strongly flavored. Add this variety of arugula to raw pesto and sauces where it's pungency will come through. Add whole leaves to grilled cheese sandwiches or a BLT. Use as a leafy bed for grilled seafood or vegetables. Arugula is a flavorful plant that makes a great pizza topping added at the end of baking, and is simply delicious in salads and sandwiches.